Gonzo’s Quest is a Net Entertainment-powered video slot with 5 reels and 20 paylines. Playable from 20p a spin to £50 a spin, it was NetEnt’s first platinum slot to be released. Based on the historical conqueror Gonzalo Pizarro (Gonzo), you will join him on his mission through the Amazon jungle in search of Eldorado (the lost city of gold). Classic spinning reels are not used in this game as Avalanche Reels are used – this means symbols fall from above. The symbols are Mayan themed and explode upon creating a winning combination. Every time you have a winning combination, the contributing symbols explode and are replaced by new symbols. As a result, the multiplier in the top right-hand corner goes up from 1x to 2x to 3x to 5x. The Free Falls Bonus feature is what you need to look out for though. This can be activated when you get 3 Free Falls symbols on consecutive reels. You will receive 10 free falls (or free spins) with the multiplier values being 3x, 6x, 9x and 15x. This means you can potential get up to a 15x multiplier on every free spin. Gonzo himself becomes quite animated when you have a decent win as he does a Michael Jackson-esque moonwalk. There are more free spins you to get during the feature. 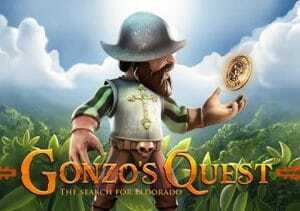 Gonzo’s Quest may be NetEnt’s first platinum slot but it’s very popular and has a bit of a cult following. Wins can be big and not very frequent so I class this as a medium variance game. I’ve only managed a 15x multiplier on 4 free spins in 1 sitting which resulted in over 400 times my stake – that was a good day. Graphically superb too I must add – like all NetEnt slots. You should also try Dead or Alive which is a high variance game and one of my favourites.